To make the pastry: Sift the flour and icing sugar into a bowl. Using a round-bladed knife or the tips of your fingers, work in the butter and then mix in the egg yolks. Add the ice-cold water until the dough just comes together. Wrap in cling film and chill for at least 30 minutes. Preheat the oven to 190°C (375°F/gas mark 5). Lightly dust the work surface with flour. Divide the pastry into 2 portions, one slightly larger than the other, then roll out the larger piece until it is about 30cm in diameter. Use to line a 20cm pie dish or a 23cm flat plate, gently pressing into the corners. Trim the edges with a knife and reserve the excess for decorating. Place back in the fridge to chill while you prepare the apples. Peel, core and slice the apples. Place in a large bowl with all but 1 tablespoon of the caster sugar. Add the cinnamon and cloves and mix together. 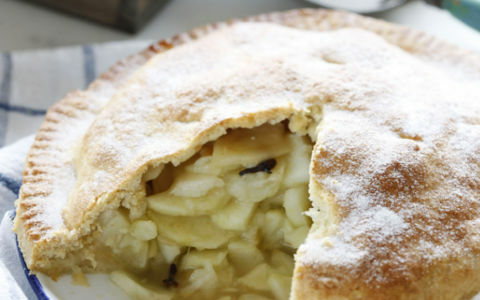 Brush the edge of the pastry with a little milk and then pile the apples into the lined pie dish. Roll out the second piece of pastry into a circle slightly larger than the pie dish and use to cover the apples. Press the edges together to seal, then use a sharp knife to cut away any excess. Crimp the edges of the tart with a round-bladed knife, using your fingers as a guide. If you wish roll out the pastry scraps and cut into leaf shapes. Brush the shapes with milk and stick on top of the pie. Brush the entire top of the pastry with milk and sprinkle over the remaining 1 tablespoon of sugar. Bake for 25-30 minutes, then reduce the oven to 180°C (350°F/gas mark 4) and bake for another 20-25 minutes, until golden brown. Meanwhile, to make the custard, place the egg yolks in a large bowl with the sugar and vanilla seeds. Whisk with an electric mixer for a few minutes, until pale and thickened. Place the milk and cream in a medium pan and bring to the boil, then immediately remove from the heat. Gradually whisk the heated milk and cream into the egg yolk mixture until smooth, then pour back into the pan and place over a gently heat. Cook gently for 6-8 minutes on a medium heat, stirring constantly, until the custard coats the back of a wooden spoon. Keep warm. To serve, cut the warm apple tart into slices and arrange on warmed serving places with some of the custard. Pour the remaining custard into a jug and hand around separately. Previous PostPrevious Mary Flahavan’s Oaty Flapjacks with chocolate on top!